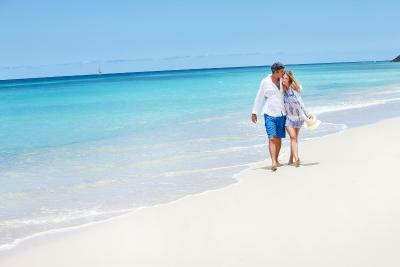 Lock in a great price for Keyonna Beach Resort Antigua -All Inclusive - rated 8.9 by recent guests. The staff were delightful and extremely helpful. Lovely location with wonderful views and lovely long sandy beaches so great for walking. Beaches were also super clean. Cocktails were pretty good in the evenings and the restaurant overlooked the beach, pretty good wines for all inclusive. Everything excellent, no complaints whatsoever. Staff friendly, helpful and always smiling. It was a great pleasure to be spending a few days at Keyonna. Very lovely small resort. Almost private beach with a few people. Friendly staff and huge thanks to Gilda she was very helpful on at least 4 topics, with her care and support. Food was brilliant, beach facilities were great, loved the rooms and above all the staff were excellent! Location was excellent, staff very friendly & helpful. Food was very good. 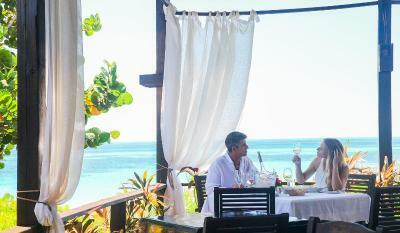 Bed comfortable, rooms are all well located to beach and restaurant, very small Boutique type hotel. Beach great for walking, ocean perfect for swimming, and not too busy or crowded. The friendly staff, fantastic food and arrractive communal area. Great staff and good food (apart from our first night). Laid back ambiance. Excellent beach location with Bali beds. The staff were amazing, as was the food and drink. With a la carte menus for every meal, almost didn't feel like ab all inclusive. Always something great on the menu. This was a quiet and peaceful getaway, with amazing views of the beach and sunset. Shawn and Paula were very nice. Clint and the head of housekeeping was extremely helpful after I had an unfortunate experience. Walk with insect repellent when eating at the restaurant due to a significant amount of sand flies! Set on the beachfront of Turners Beach, this boutique hotel offers panoramic views of the Caribbean Sea and of Monsterrat Island. Keyonna Beach All Inclusive features a restaurant and a bar. The air-conditioned rooms and cottages at Keyonna Beach are spacious and feature beach décor. 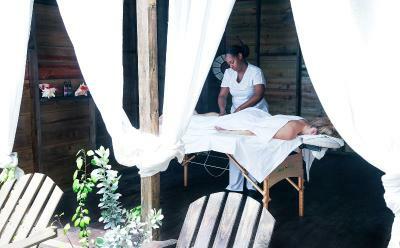 Each offers 4-poster beds and private verandas or patios, as well as a private bathroom with shower. This hotel caters to couples only and does not allow children. Featuring a wooden terrace with loungers and Balinese beds, the Beach Restaurant serves fresh seafood and daily specialities. 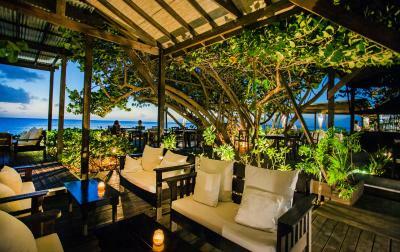 The bar offers a selection of international wines, Caribbean spirits and rums. Keyonna Beach All Inclusive is located 20 minutes’ drive from the St. Johns’ capital, and 30 minutes’ drive from V.C Bird International Airport. The lively Jolly Harbour Marina is 5 minutes by car. This property also has one of the best-rated locations in Saint Johnʼs! Guests are happier about it compared to other properties in the area. This property is also rated for the best value in Saint Johnʼs! Guests are getting more for their money when compared to other properties in this city. 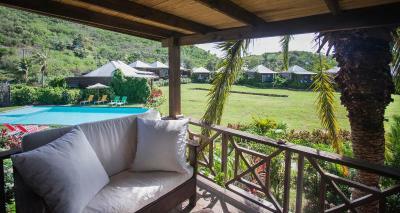 Keyonna Beach Resort Antigua -All Inclusive has been welcoming Booking.com guests since 10 Feb 2012. 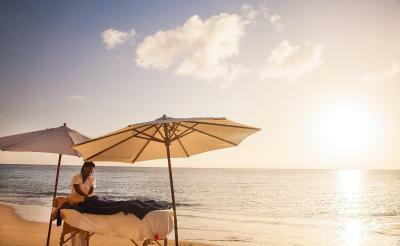 When would you like to stay at Keyonna Beach Resort Antigua -All Inclusive? Located a few steps from the beach, this air-conditioned room features free Wi-Fi and a private balcony with views of the Caribbean Sea. Decorated in neutral tones with handmade wooden furniture, the room has a 4-poster bed, 110v power sockets and an en-suite bathroom. 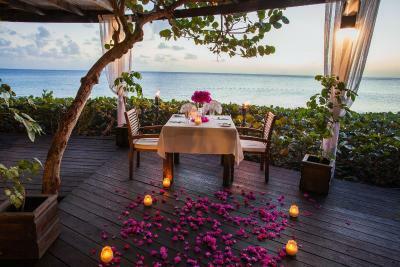 Located on the beachfront, this air-conditioned room features a private balcony with views of the Caribbean Sea. The room has a 4-poster bed, and an en-suite bathroom. This air-conditioned bungalow offers a ceiling fan, a electronic safe, a fully stocked minibar and tea and coffee-making facilities. 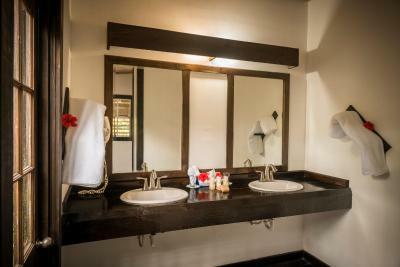 The en suite bathroom includes a double sink, a hairdryer and an open-air shower. These units feature a four-poster king size bed, air-conditioning, outdoor shower, mini bar which is restocked daily, tea and coffee making facilities, free WiFi, hair dryer, in-room safe, iron and ironing board, french doors opening onto a spacious balcony with private plunge pool, private bali bed and pool loungers. 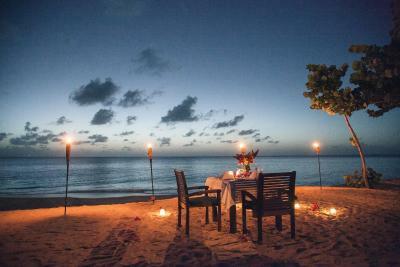 House rules Keyonna Beach Resort Antigua -All Inclusive takes special requests - add in the next step! Keyonna Beach Resort Antigua -All Inclusive accepts these cards and reserves the right to temporarily hold an amount prior to arrival. Still arrogant attitude from some waiter..
We were hoping to get lots of lovely local fresh fish but sadly the fish served was often covered in oil and over cooked. The food and lack of facilities really let it down. Such a shame the Yoga was next to the bar which was noisy (ice machine etc going off all the time) with people walking through constantly. For all inclusive there were v few facilities, just a few snorkels and a couple of canoes would have made a big difference. Some of the sun loungers etc were looking in need of attention, the towelling covers and pillows were really dirty and curtains etc torn....verging on shabby but again the staff made up for all the not so good stuff. 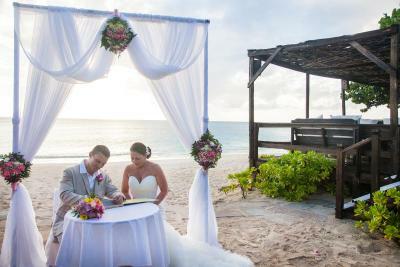 A perfect couples paradise; Wedding Venue; Find each other again. A big thank you to Chiquira (wedding planner), Shaun, Clint, Jamel, Odel, Elvis and all of the staff. No TV or music, just the sound of the sea. The drinks could be better. Rather sweet! Felt a bit impersonal as although the staff were nice and helpful there was no obvious management pulling things together or talking to guests. Fabulous location, great food, comfortable and clean rooms. Excessive number of visitors from cruise ships coming into our cottage area and using it like they paid for the stay. It was a daily occurrence. The food was amazing, Acari was great and Cordel the driver was fantastic! Everyone was very helpful with my fiancé’s bug bite. Best beach and beach exclusivity I have ever seen/ Bermuda beds great. Being on a ground floor it was quite noisy when upstairs people moved around at night. Service, depended who you got, but not great, you both order your breakfast and lunch at same time, one arrives and the other does not, so you wait and after 5 minutes you ask if they know what happened, they forgot to put other order in...no information on nightly events, found out from another couple that there was going to be a wine tasting event that evening, if we had not met them we would never had known,....food was so so, but not fantastic, meats were all over cooked, needed more choices regarding salads and veggies. Constantly had to ask to re stock mini bar in room, finally on 4th day got the club sodas and water...also mini bar comes with a choice of rum, vodka, gin, etc which you book prior to arrival and are only allowed 2 choices..they got that wrong and took 4 days to get. Booking.com should send a rep to check out facilities as well as, give proper information on rooms reserved as we did not get what we thought we were getting when we arrived, they changed our room the next day, we were lucky as the hotel was not that busy....Bring bug cream, you will get eaten alive especially after dusk as all the seating areas are outside including restaurant and lobby. Wine selection ok but not high end, booze, ok..In general, hotel very expensive for what they offer which really was mediocre but they get away with it as it is in a great location, place needs a paint job and freshen up which would not take much to do, it's getting used looking...we just got back 3 days ago. Car rental is available at airport but beware, roads are awful, very dangerous with lots of cracks, pot holes, crevices and dips, get fully insured if you are going to drive.